AllSafe Defense Systems provides the full range of NRA Instructor Certification Courses. If you are ready to step up and help others learn about safety, firearms, and the responsibilities that go with them, choose your area of interest from the topics below. PISTOL: This course is designed to train experienced shooters the techniques necessary to teach the basics of PISTOL marksmanship. Prospective instructor candidates are required to sit through an NRA Basic Pistol Course before attending the Instructor course to experience the “NRA Way” of “total participant involvement,” The goal of this prerequisite is to develop the skills required to be a dynamic and effective instructor. (If you would like a referral to an instructor who gives a discount for those attending to satisfy the prerequisite, contact Todd Larato via E-mail HERE.) The Instructor course is designed to teach the basics of pistol marksmanship and how to teach the functions of the different kinds of handguns and ammunition. The course emphasizes firearms safety while training instructors to teach the techniques of aiming, breath, hold, and trigger control. 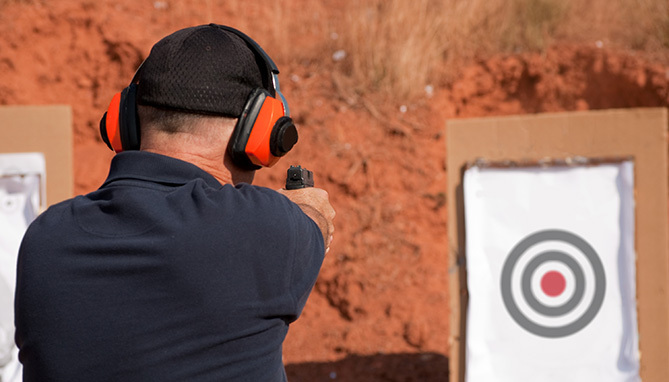 This Pistol Instructor Certification is a required prerequisite to NRA Personal Protection Instructor course. RIFLE: This Rifle Instructor discipline includes the NRA “Trainers Guide” (as all the Instructor disciplines) and then offers experienced shooters the techniques necessary to teach the basics of rifle marksmanship. Instructor candidates will learn the teaching methods to effectively teach all four positions of standing, kneeling, sitting and prone. This is the course required to offer the Boy Scout Rifle merit badge and the 4-H Rifle shooting course. Certification requires participation in all class exercises and a successful completion of a written test. SHOTGUN: In addition to the NRA “Trainers Guide,” this course is designed to train experienced shotgunners to teach novices the proper skills required to hit a moving target. The NRA Shotgun Course teaches stance, gun ready position, swing to target, trigger pull, and follow through. The course encourages students to enjoy shotgun games and shooting activities. HOME FIREARM SAFETY: This course is designed to train experienced shooters to teach people how to safely and responsibly handle firearms. Instructors learn how to teach the clearing of all different kinds of firearms, including pistols, rifles and shotguns. Instructor candidates will learn how to offer safety methods of storing and caring for firearms and ammunition in the home. This course also includes an emphasis on the NRA Eddie Eagle child safety program. PERSONAL PROTECTION IN THE HOME: (must be currently certified as NRA Pistol Instructors) This course is designed to train experienced shooters the techniques necessary to teach the tactical skills and mental attitude essential for the prevailing in a live threatening encounter. The instructor candidates will shoot the course of fire to understand the process of administering a stress-fire handgun course. Without involving politics, the course also discusses the right of law-abiding citizens to use lethal force for self defense. PERSONAL PROTECTION OUTSIDE THE HOME: (For previously certified PP INSIDE the Home Instructors) this is the premiere Concealed Carry Weapon course in the United States. It teaches the effective use of a concealed handgun and includes concealment techniques and devices, presenting the handgun from concealment, utilizing cover, movement, point shooting, engaging multiple targets, one-hand shooting, and low-light shooting. Also included are strategies for preventing violent encounters and the legal ramifications of using lethal force in self defense outside the home. NRA textbook and certificate are included. For more details, click here. RANGE SAFETY OFFICER: This course offers experienced shooters the certification to necessary to supervise range operation, and is essential to organizing, conducting, and supervising safe shooting activities. The class textbook and the sample SOP will give you a solid reference for managing a shooting facility, including running a firing line, establishing range safety guidelines and operational procedures, and creating an effective Emergency Plan for any shooting event, activity, or competition. RELOADING (Metallic Cartridge/Shotshell): Two separate courses, they offer instructor training necessary to teach the fundamentals and procedures of safe and rewarding reloading experience, including brass preparation and hull selection, proper primer and powder handling, and bullet or shot selection, seating, and crimping. *TJ Johnston has been appointed as a “Master Training Counselor” by the NRA Training Department and is a Chief Range Safety Officer and Regional Counselor for the NRA’s Refuse to be a Victim program. He has also been credentialed as an “Advanced Defensive Pistol Instructor” by the NRA.